When people mention Hasbro, one would probably think they’re the Mr. Potato head people or they’re the My Little Pony company and they would technically be correct. But what most laymen wouldn’t realize is that this company whose origins goes back to the tiny state of Rhode Island has made enough acquisitions in its lifetime that could keep pace with Disney. In fact it is through acquisitions that Hasbro became one of the largest board game makers in the world. One of these acquisitions is Wizards of the Coast, the makers of one of the most prolific trading card games ever released, Magic the Gathering. It’s shocking that despite owning Wizards of the Coast for over nearly 20 years, the company has never has never utilized any of the IPs held by their parent company. That finally changed in 2018 and at PAX Unplugged, Wizards of the Coast brought one of their newest titles featuring Hasbro’s biggest IPs. Transformers Trading Card Game caught my eye even though I aimed to keep my coverage of PAX Unplugged purely focused on all things video games. However I was unable to ignore the siren song of these robots in disguise and booked an appointment without hesitation. As a lapsed “player” (I was more a buyer than a player to be honest…) of collectible card games, mental images of how the game would work danced in my head as the appointment drew near. Would Energon replace the colored mana system from Magic as a primary resource? Why would robot cast spells? All these questions would be answered when I finally sat down with Drew Nolosco, a brand manager at WotC. The first thing I asked Drew was to get a demo of the game. He did not have any pre-made decks on hand, but that did not hinder him at all. Drew directed me to a box of booster packs that was sitting on the table and asked me to select two packs and he would take two packs as well. We opened our packs and took out the two oversized character cards and fourteen standard size battle cards which would act as our deck. I was surprised that Transformers TCG can get a game going such minimal monetary investment, something that that couldn’t be done with Magic the Gathering. Once everything was set up, Drew had two Transformers and I had two on my field. Checking the star ratings of our Transformers it seemed that my characters outclassed his. A standard game allows you to have a party whose star ratings equal or below 25. In our demo match my party’s star rating was 20, and Drew’s was 12. So a damage handicap was placed on my bots and our match began. First I transformed one of my characters from their alt mode to their robot mode (not necessarily required as some alt modes actually have stronger attacks than their robot modes) and applied an upgrade card to a character on the field which could affect their stats or grant abilities which would help in battle. Once this prep work was done the fighting would begin, I would choose one of my characters to attack one of Drew’s. We would then draw 3 cards, which would determine whether the attack or defense would be buffed. In this first skirmish Drew would manage to negate my attack with his luck of the draw. This would go back and forth until I eeked out a narrow victory (Thanks Drew for taking it easy on me!). After a very fun initial skirmish Drew and I talked about what lies ahead for the title. One of the newer releases for this line was Metroplex. For those who don’t know Metroplex is a City Size Autobot and you can definitely tell in the card game as his card is roughly the size of 2 character cards laid side to side. So with a wealth of characters to dip into this game will not be hurting to find recognizable characters to put into the battlefield. During this conversation I found out just how much care and thought were put into the creation of this game. Some Battle cards have references to iconic scenes from transformers lore such as “One Shall Stand, One Shall Fall” which is from the animated movie from 1984. Another card which draws from that movie is “I Still Function!”, one which Drew has seen high level strategies develop around its use in conjunction with a specific Dinobot. Drew further reiterated the game was made to be easy enough that non-ccg players can pick up and play. Well it certainly made an impression on me and as soon as this line introduces Combiners I am ready to go all in…Even if my favorite combiner is canonically a jobber (but I still love you Computron!). 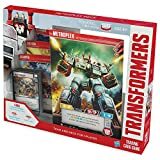 Transformers Trading Card Game is currently available in 3 forms, the 2 player starter deck, Booster packs and the Metroplex Deck. These are available where trading card games are sold.